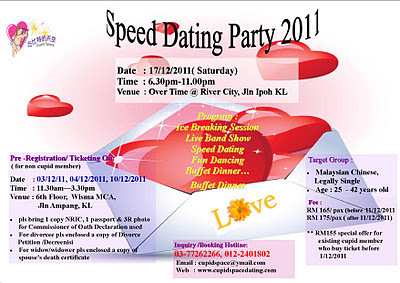 Cupid Speed Dating Party 2011 - a party event for Malaysian Chinese who are legally single to gather and meet for friendships, you will have opportunity to mingle with 200- 250 singles during the even nite. This is Cupid Space Dating"s yearly grand event , don't miss the fun time , Call 012-2401802 now for booking.
" Cupid Speed Dating Party 2011"